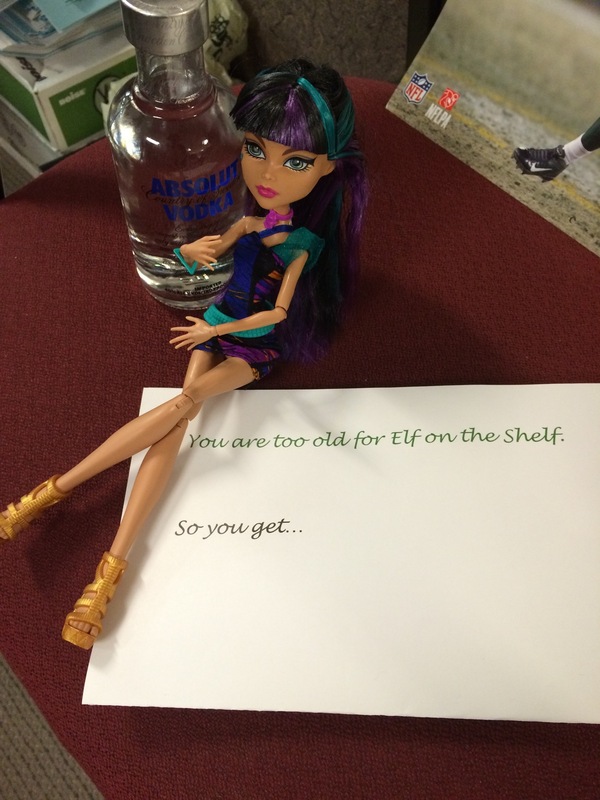 Elf on the Shelf, so adorably creepy. Kids love it, adults feel doll eyes watching them. But, you say, but what about for us big kids? Are we to be left out of the amusement? The holiday joy? Can’t we have a tradition of our own? If you have asked this of yourself, I have the answer for you. I bring you…drumroll please…Whore in the Drawer! She is not kid friendly and she comes with alcohol. Perfect for that big kid in your life. PS this really isn’t work appropriate either but we admins say, “throw your hands in the air like you just don’t care” and do it anyway. I am so excited to find her in my cube one day soon! Thats a Monster High doll…geared to kids age 3 and up for the record. I stand by my perverted joke thank you very much.